A-weighting is the most commonly used of a family of curves defined in the International standard IEC 61672:2003 and various national standards relating to the measurement of sound pressure level. A-weighting is applied to instrument-measured sound levels in an effort to account for the relative loudness perceived by the human ear, as the ear is less sensitive to low audio frequencies. It is employed by arithmetically adding a table of values, listed by octave or third-octave bands, to the measured sound pressure levels in dB. The resulting octave band measurements are usually added (logarithmic method) to provide a single A-weighted value describing the sound; the units are written as dB(A). Other weighting sets of values – B, C, D and now Z – are discussed below. A-weighting began with work by Fletcher and Munson which resulted in their publication, in 1933, of a set of equal-loudness contours. Three years later these curves were used in the first American standard for sound level meters. This ANSI standard, later revised as ANSI S1.4-1981, incorporated B-weighting as well as the A-weighting curve, recognising the unsuitability of the latter for anything other than low-level measurements. But B-weighting has since fallen into disuse. Later work, first by Zwicker and then by Schomer, attempted to overcome the difficulty posed by different levels, and work by the BBC resulted in the CCIR-468 weighting, currently maintained as ITU-R 468 noise weighting, which gives more representative readings on noise as opposed to pure tones. A-weighting is valid to represent the sensitivity of the human ear as a function of the frequency of pure tones, but only for relatively quiet levels of sound. In effect, the A-weighting is based on the 40-phon Fletcher–Munson curves which represented an early determination of the equal-loudness contour for human hearing. However, because decades of field experience have shown a very good correlation between the A scale and occupational deafness in the frequency range of human speech, this scale is employed in many jurisdictions to evaluate the risks of occupational deafness and other auditory problems related to signals or speech intelligibility in noisy environments. Because of perceived discrepancies between early and more recent determinations, the International Organization for Standardization (ISO) recently revised its standard curves as defined in ISO 226, in response to the recommendations of a study coordinated by the Research Institute of Electrical Communication, Tohoku University, Japan. The study produced new curves by combining the results of several studies, by researchers in Japan, Germany, Denmark, UK, and USA. (Japan was the greatest contributor with about 40% of the data.) This has resulted in the recent acceptance of a new set of curves standardized as ISO 226:2003. The report comments on the surprisingly large differences, and the fact that the original Fletcher–Munson contours are in better agreement with recent results than the Robinson-Dadson, which appear to differ by as much as 10–15 dB especially in the low-frequency region, for reasons that are not explained. Fortuitously, the 40-phon Fletcher–Munson curve is particularly close to the modern ISO 226:2003 standard. Nevertheless, it will be noted that A-weighting would be a better match to the loudness curve if it fell much more steeply above 10 kHz, and it is likely that this compromise came about because steep filters were difficult to construct in the early days of electronics. 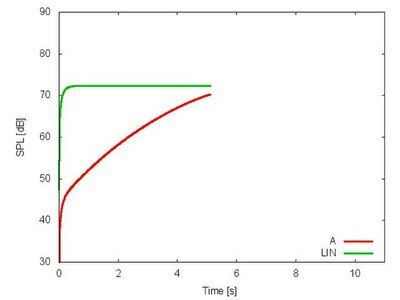 Nowadays, no such limitation need exist, as demonstrated by the ITU-R 468 curve. If A-weighting is used without further band-limiting it is possible to obtain different readings on different instruments when ultrasonic, or near ultrasonic noise is present. Accurate measurements therefore require a 20 kHz low-pass filter to be combined with the A-weighting curve in modern instruments. This is defined in IEC 61012 as AU weighting and while very desirable, is rarely fitted to commercial sound level meters. Z- or ZERO frequency-weighting was introduced in the International Standard IEC 61672 in 2003 and was intended to replace the "Flat" or "Linear" frequency weighting often fitted by manufacturers. This change was needed as each sound level meter manufacturer could choose their own low and high frequency cut-offs (–3 dB) points, resulting in different readings, especially when peak sound level was being measured. It is a flat frequency responce between 10 Hz and 20 Hz ±1.5dB. As well, the C-frequency-weighting, with –3 dB points at 31.5 Hz and 8 kHz did not have a sufficient bandpass to allow the sensibly correct measurement of true peak noise (Lpk). B- and D-frequency-weightings are no longer described in the body of the standard IEC 61672 : 2003, but their frequency responses can be found in the older IEC 60651, although that has been formally withdrawn by the International Electro-technical Commission in favour of IEC 61672 : 2003. The frequency weighting tolerances in IEC 61672 have been tightened over those in the earlier standards IEC 179 and IEC 60651 and thus instruments complying with the earlier specifications should no longer be used for legally required measurements. A-weighted decibels are abbreviated dB(A) or dBA. When acoustic (calibrated microphone) measurements are being referred to, then the units used will be dB SPL referenced to 20 micropascals = 0 dB SPL. dBrn adjusted is not a synonym for dBA, but for dBa (in telecommunications dBa denotes "decibels adjusted" i.e. weighted absolute noise power, which has nothing to do with A-weighting). The A-weighting curve has been widely adopted for environmental noise measurement, and is standard in many sound level meters. The A-weighting system is used in any measurement of environmental noise (examples of which include roadway noise, rail noise, aircraft noise). A-weighting is also in common use for assessing potential hearing damage caused by loud noise. A-weighted SPL measurements of noise level are increasingly found on sales literature for domestic appliances such as refrigerators, freezers and computer fans. In Europe, the A-weighted noise level is used for instance for normalizing the noise of tires on cars. The A-weighting is also used for noise dose measurements at work. A noise level of more than 85 dB(A) each day increases the risk factor for hearing damage. Noise exposure for visitors of venues with loud music is usually also expressed in dB(A), although the presence of high levels of low frequency noise does not justify this. Although the A-weighting curve, in widespread use for noise measurement, is said to have been based on the 40-phon Fletcher-Munson curve, research in the 1960s demonstrated that determinations of equal-loudness made using pure tones are not directly relevant to our perception of noise. This is because the cochlea in our inner ear analyses sounds in terms of spectral content, each 'hair-cell' responding to a narrow band of frequencies known as a critical band. The high-frequency bands are wider in absolute terms than the low frequency bands, and therefore 'collect' proportionately more power from a noise source. However, when more than one critical band is stimulated, the outputs of the various bands are summed by the brain to produce an impression of loudness. For these reasons equal-loudness curves derived using noise bands show an upwards tilt above 1 kHz and a downward tilt below 1 kHz when compared to the curves derived using pure tones. This enhanced sensitivity to noise in the region of 6 kHz became particularly apparent in the late 1960s with the introduction of compact cassette recorders and Dolby-B noise reduction. A-weighted noise measurements were found to give misleading results because they did not give sufficient prominence to the 6 kHz region where the noise reduction was having greatest effect, and did not sufficiently attenuate noise around 10 kHz and above (a particular example is with the 19 kHz pilot tone on FM radio systems which, though usually inaudible is not sufficiently attenuated by A-weighting, so that sometimes one piece of equipment would even measure worse than another and yet sound better, because of differing spectral content. ITU-R 468 noise weighting was therefore developed to more accurately reflect the subjective loudness of all types of noise, as opposed to tones. This curve, which came out of work done by the BBC Research Department, and was standardised by the CCIR and later adopted by many other standards bodies (IEC, BSI) and, as of 2006[update], is maintained by the ITU. It became widely used in Europe, especially in broadcasting, and was adopted by Dolby Laboratories who realised its superior validity for their purposes when measuring noise on film soundtracks and compact cassette systems. Its advantages over A-weighting are less accepted in the US, where the use of A-weighting still predominates. It is used by broadcasters in Britain, Europe, and former countries of the British Empire such as Australia and South Africa. ^ Rimell, Andrew; Mansfield, Neil; Paddan, Gurmail (2015). "Design of digital filters for frequency weightings (A and C) required for risk assessments of workers exposed to noise" (PDF). Industrial Health (53): 21-27. Retrieved 16 April 2019. ^ Lauer, Amanda; El‐Sharkawy, AbdEl‐Monem M.; Kraitchman, Dara; Edelstein, William (2012). "MRI Acoustic Noise Can Harm Experimental and Companion Animals". JOURNAL OF MAGNETIC RESONANCE IMAGING. 36 (3): 743-747. Retrieved 16 April 2019. ^ Bauer, B.; Torick, E. (1966). "Researches in loudness measurement". IEEE Transactions on Audio and Electroacoustics. 14 (3): 141–151. doi:10.1109/TAU.1966.1161864. ^ a b c d IEC 61672-1:2013 Electroacoustics - Sound level meters - Part 1: Specifications. IEC. 2013. ^ RONALD M. AARTS (March 1992). "A Comparison of Some Loudness Measures for Loudspeaker Listening Tests" (PDF). Audio Engineering Society. Retrieved 2013-02-28. Noise Measurement Briefing. Archived from the original on 2013-02-25.
AES pro audio reference definition of "weighting filters"